Ricardo Palomares lives on the back of a bicycle. He rides farther before lunch than the average American does in a year. Bears are a normal, even accepted, part of his mornings. He rarely gets to sleep in a real bed. Ricardo quit his job in commercial photography for this lifestyle, and he couldn’t be happier. 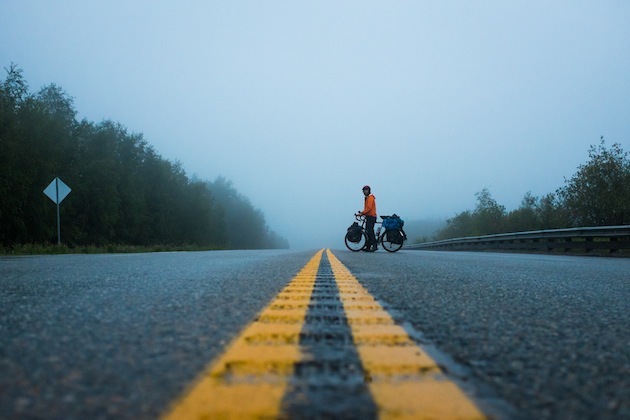 Palomares, BS ’12, and three other UT alumni—filmmaker Riley Engemoen, BS ’13, writer/editor Dyar Bentz, BA ’12, and photographer/filmmaker Thomas Allison, BJ ’12—have created a documentary project called Pedal South. 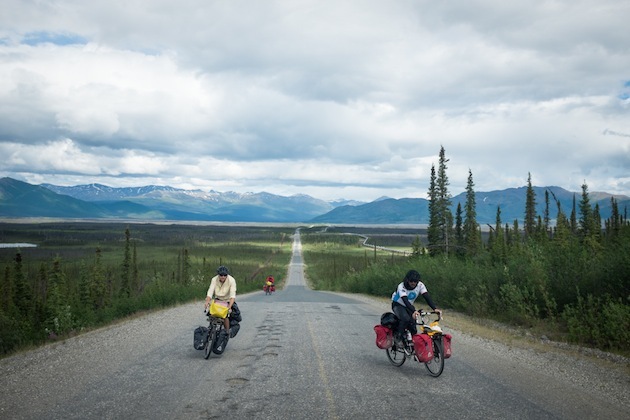 The project shares stories and experiences of people the team meets as they travel the 18,000-mile journey from Deadhorse, Alaska—well within the Arctic Circle—to the tip of Argentine Patagonia. Ricardo acts as the documentary’s producer as well as a filmmaker, which means he meets with sponsors, donors, and other groups along the journey while still shooting video and interviewing people for the website. The Alcalde sat down with Ricardo during one of his infrequent visits to Austin, to talk about Pedal South, the dangers of living on the road, and what happens after the journey ends. Alcalde: So you’re about a third of the way through the journey? Ricardo Palomares: Yeah, we’re in Mexico City right now. We started in Deadhorse, Alaska. 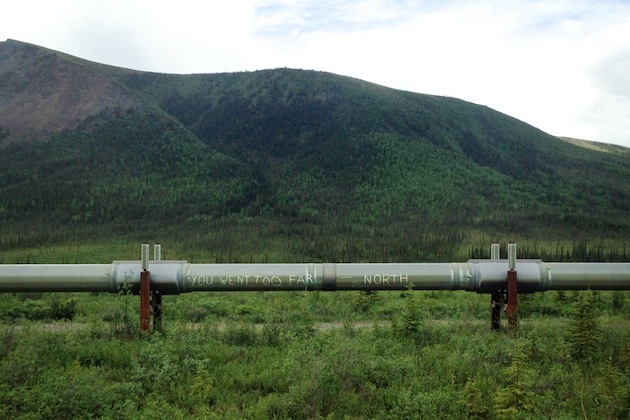 The highway starts right there, the Dalton Highway, and there’s just nothing. It’s just this gravel mud highway for a couple weeks. Why did you start in Deadhorse? It’s the northernmost part of the continent, and there’s actually a highway there. I think there are other areas of the north coast [of Alaska] that I think you have to fly [to], you can’t get there by car. So that’s the start of the Pan-American highway. So what inspired you to do Pedal South project? Two of the team members—we had five members, now we have four; one left—did [the charity bike ride] Texas 4000 and somewhere along the route they met someone doing the Pan-American highway that we’re doing, and kind of just got inspired. All of us are storytellers—we’re filmmakers, photographers, and writers—and I think Jack [teammate that left] and Dyer [Bentz, team writer/editor] came up with this idea of having a lifestyle of just exploring and telling stories, and then I got invited to the team. How do you choose stories? The stories find us. First of all, on the website there’s less than 10 percent of what we actually do. It’s such an extreme experience that we don’t have the time to edit or produce the amount of experiences we have constantly. We just interview anyone or pursue any story that we’re attracted to, honestly. We want to show a really broad perspective of the Americas beyond socioeconomic status, beyond religion, beyond borders, race, whatever. And someday it could be a drug addict, and the next day it could be a doctor, and the next day a window-washer. This is it. I didn’t even train—I just showed up. I went to Mexico City to see my family and got a little fat because I was eating a ton of Mexican food, but that’s it. I just showed up and started doing it. I think one thing I’ve learned about this project is about that it’s all about showing up. Has it been dangerous on the road? Yeah, there’s been a lot of danger. A lot of wildlife, a lot of bears, wolves, moose. We’ve been in danger of storms. Honestly, I think the traffic and the trucks and the other things that we deal with cycling on the road have been really dangerous. [We’ve had] a couple close calls, for sure. I think a couple parts in the U.S. and a lot of parts in Mexico, people are not used to cyclists as much. What’s your favorite story you’ve come across and documented? I think one that sticks out [is] we interviewed this doctor in Seattle [who] invented this drug called Tumor Paint. How it works is they took scorpion venom and changed the DNA and added light to it, so when it goes into the bloodstream it finds the cancer cells and lights them up, so when the doctor comes and operates they can differentiate between the cancer cells and the body. What’s the most scared you’ve been, or one of the most painful experiences you’ve had on the road? There’s a lot of physical and, more than anything, mental struggle. Nowadays it’s a lot better, but I can tell you definitely three months ago it was a constant struggle every single day. As far as stories … once, we were in the Yukon River and this guy was going to give us a boat ride, and we just thought he was an interesting guy to make a story about. As soon as we got into the boat, the guy just went bananas: smoking a lot of weed, taking vodka shots, shooting shotguns. We go into the middle of the forest to find the house, he got more drugs, got more guns, started shooting more stuff. There’s not really a time I’ve been scared—just really uncomfortable a lot of the time. What is a day-to-day routine for you and your team? It changes every time. We’ll wake up camping in a cave looking at the ocean; we’ll just go cycle 60 miles; we’ll find a story, find some food; we’ll find another place to camp, cook food over a fire, and go to sleep. That’s a pretty normal day. If we’re in a city, we try to rest as much as we can—enjoy the bed because we don’t have that at all—and just work on our stories. There are some other days when we were cycling 10 hours a day. What excites you the most about the next leg of the trip? I want to see South America. I’ve seen it before, but with Pedal South it is different for me. I was so excited to go to Mexico because I had the opportunity to go back and help my country and show how beautiful it really is. There’s a lot of bad press about my country, but my goal is to show the beauty of it and how hospitable we are and the natural beauty of it. I’m excited to see that and do the same the rest of the trip; I’m excited to do that in Central America. This is pretty much my dream come true. It definitely feels like Pedal South is representing something bigger than ourselves, and along the way we’re inspiring a lot of people in ways we never thought were going to happen. We’ve created this massive wave and now we’re surfing it.